I’ve just come back from my old hometown of Stroud, in Gloucestershire, in the UK. Development has drastically altered the face of the town, but the basics don’t change. The High Street is still as narrow but thankfully now pedestrianized. Imagine this with two way traffic, including buses and trucks. Stroud itself nestles at the convergence of five valleys in the Cotswold Escarpment. The valleys were termed the Golden Valleys, due to the industry that once thrived there. So what does this have to do with art and craft? Laurie Lee, the author of Cider With Rose, lived in the Slad Valley. Jilly Cooper, Joanna Trollope and Katie Fforde also live in and around Stroud. Katie Fforde particularly, uses Stroud for her settings. While writing is a craft with which all authors usually have a love/hate relationship, it is more generic art and craft I’m thinking of today. One definition of craft is the skill in doing or making something, as in the arts or an occupation or trade requiring manual dexterity or skilled artistry. That being so, I claim to be a crafter for having knitted a tea cozy as a Christmas gift for a friend last year. Now, I had not knitted anything in well over twenty years and I know for a fact the last tea cozy I knitted was Christmas, 1965. So how does this tie in to my old stamping grounds? The Cotswolds were once famous for their sheep, a mostly white breed useful for both meat and wool and which is now on the Rare Breeds list. It is said they grazed the hillsides before the Romans arrived. The hills they grazed on got their name from the old Anglo-Saxon for sheep pens, or cottes, and wealds, meaning a high windswept place. I doubt the wool for my tea cozy came from any such sheep, but the trade is commemorated today in Stroud by this piece of statuary at the top of the High Street. Pubs such as the Wool Pack and the Ram and the annual Tetbury woolsack races all have their roots in the wool trade which began in the Middle Ages. At one time water from the River Frome powered no less than 150 mills along the valley bottoms. These mills have now been repurposed, most recently Ebley Mill which is now the home of the Stroud District Council. As transport by road was so difficult, time consuming and costly, the advent of the canal system made a huge impact for local business owners. The Cotswold Canal system extends for 36 miles, and rises 362 feet above sea level by a series of 56 locks along its length. 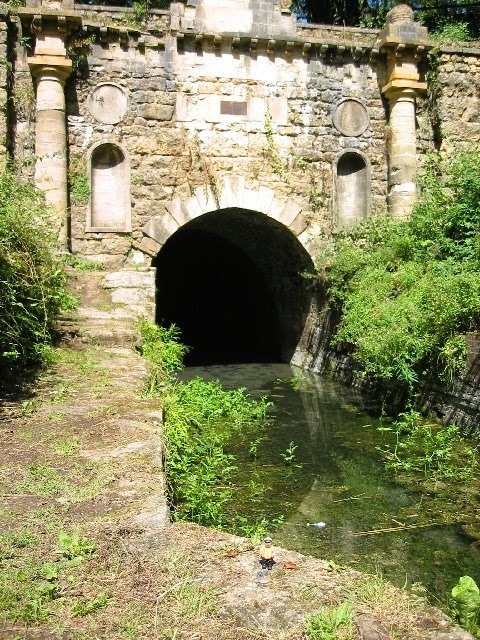 The link between the River Thames and the River Severn was via the Sapperton Tunnel, once the longest canal tunnel in England at 2.17 miles (3.49 kms) long. It is no longer navigable due to the roof having collapsed in several places but it is hoped that it will one day be restored. The art of craft in this tunnel is in the brickwork and the architecture of the portals, Daneway at the west end of the tunnel and Coates shown here at the east end. A large part of this canal system has been restored, but canal work parties formed entirely of volunteers tidy towpaths, fund raise and commemorate their work with these colorful murals beneath a bridge. This panel depicts the Cotswold sheep and a hot air balloon. Ballooning is popular in the area. Whether it is a mullioned window set in a 15th century hall, an ornamental ironwork lamp above the gateway leading into the churchyard or an oak lock gate, the art of craft abounds in this part of the world. I love it there and am always sad to leave. Now I'm back in Canada it's time to return to my craft, so it's back to the keyboard and my work in progress. Also a former knitter. Once when I was in bed with pneumonia I knit several afghans for Cjristmas presents and Argyle socks for my husband. Always interesting to return home and the pictures are great. Thanks Janet. I actually had forgotten how much I enjoyed knitting. I gave it up because of severe tennis elbow, ironically from playing badminton. Knitting is a skill I never mastered, so I admire anyone who has! But I don't mind betting you can do something I can't! What a lovely post. I am like you, haven't knitted in years, then a few months ago, I knitted my small granddaughter a hat. I love the history in England, it is just amazing. Lovely post and interesting pics. I'm not a 'crafty' person, but did knit years ago until my hands refused to cooperate. That tea cosy brought back so many memories. We always had one over the teapot at home but these days of tea bags no one seems to make tea in a pot any more. Such an interesting post, and I love the photos. I took up crocheting a few years ago after having abandoned the craft a couple of decades earlier. I love working with all the wonderful fibers on the market these days!